Selection of 69 Cash coins including a wide range of different types, mostly cleaned. 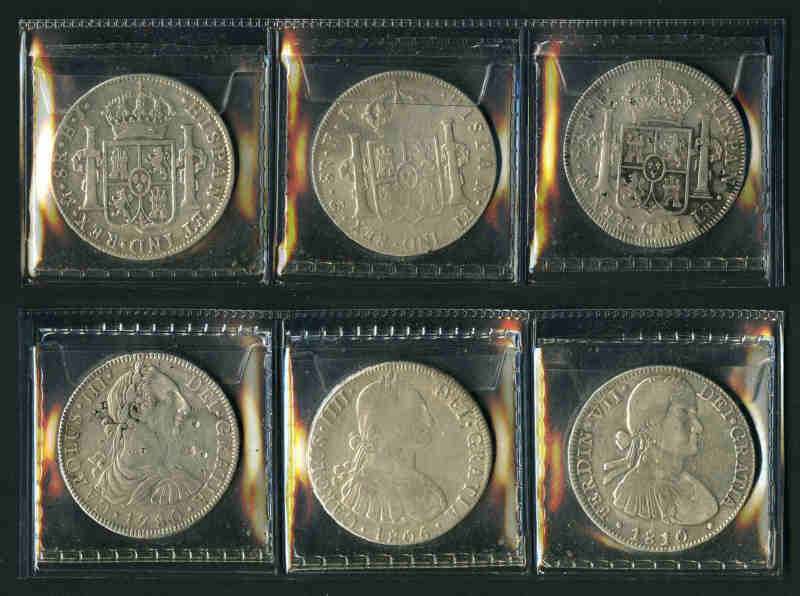 1780FF Charles III 8 Reales, 1810HJ Ferdinand VII 8 Reales and Bolivia 1805/PTS PJ Charles IIII 8 Reales Silver coins F.
1877 Trade Silver Dollar VF and 1884o aUnc, 1886 EF, 1900 aUnc, 1900o EF, 1904o aUnc, 1921 EF and 1921s VF Morgan Silver Dollar's. 1900o reverse with Die Crack from 9 o'clock right through to 1 o'clock. Accumulation of hundreds of coins from a range of countries and periods in small box. Collection of coins, mainly from West Germany, East Germany and Mexico including numerous uncirculated coins and coins with Silver content. Also Australia 1977 50¢ Silver Jubilee coins in part mint rolls (37). The actual silver content of coins in the lot is 13.114oz. Accumulation of 12¾kg of Foreign coins from a range of countries and periods. Noted Great Britain 1864 Queen Victoria Gold Half Sovereign with die number VG and small range of Silver coins, plus several banknotes. Main strength in Canada, Great Britain, New Zealand and USA. 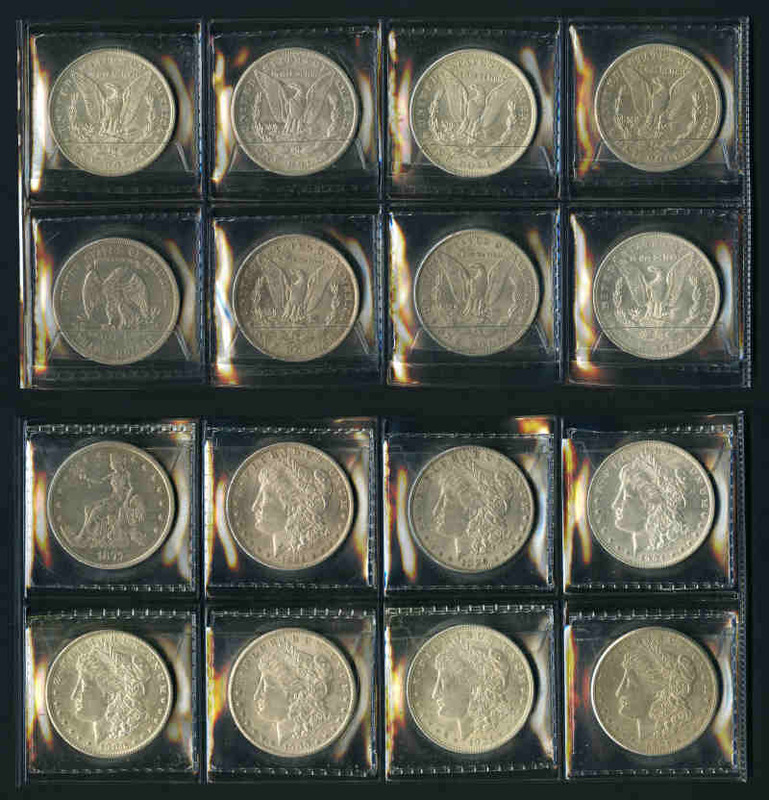 Accumulation of over 8kg of Foreign coins from a wide range of countries and periods,including a range of Silver coins, in 7 albums. Approximately 400g of actual Silver content. 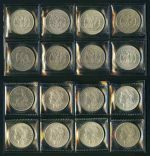 Accumulation of coins from a range of countries and periods in small box including selection of silver coins, plus Australia $1.00 coin roll. Noted Australian Florins (5), France 1874 5 Francs and USA 1880 Morgan Dollar.